Migraines: There is No Need to Suffer! Since I'm in a sharing mood at the mo' (read all about my extensive knowledge of, er, earplugs), here's something else I know quite a bit about that might be of some use to some of you. Now, I'm not an expert about all of this stuff, but here's what I do know in relation to me. You don't need to put up with them, because there are a lot of things that can help. But here's what doesn't: regular over the counter painkillers. If you are genuinely suffering from migraines and not just bad regular headaches then you won't be able to banish the pain with paracetamol or even stronger codeine-based tabs like Nurofen Plus. You may find the pain goes on in waves for up to 48 hours or more; it needn't necessarily be the 'classic' migraine with aura or vision disturbance either. I used to get those as a teenager; now I get a punching, rhythmic throbbing behind one eye that lasts two days and makes me want to rip my face off. Migraines are a specific type of headache and they need a specific pill, a triptan. And triptans like Zomig and Imigran work really well on them, putting the pounding down pretty quickly. Yes, it might - and probably will - come back (mine do), and in that case I take another tab 12 or 24 hours later. But it's all about managing it so you can live your life. You can get migraine medicine in differing strengths and delivery methods - for some people, the sickness they suffer along with the headache means a spray method is best. Or you can get tabs to dissolve on the tongue as well as ones you swallow with water, and Botox has now been approved too as a treatment. The point is there's choice and there is zero need to lock yourself in a dark room and suffer. Some people find that Migraleve (the pink and yellow tablets) you buy over the counter here work for them - it never worked a jot for me, but hey, it's worth a go. 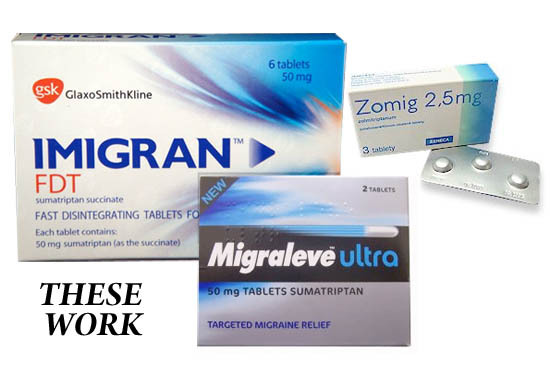 What does have an effect is Migraleve Ultra or Imigran Recovery, 50mg over-the-counter medications you can buy off-prescription in the UK and northern Ireland, and the reason they work is because they contain sumatriptan. They make the whole business of suffering a migraine much easier if you can get hold of them online or buy next time you travel as they're not that expensive - about £7-£8 for two. It's such a shame you can't buy them in the chemist here as generally in Ireland, medication is costly - Zomig and Imigran won't give you much change from €70 or €80 for six. You can ask for the generic of each in pharmacy - but it depends on where you go, and it may not be available. The other thing you can do if you're locked in a cycle of migraine-treat/migraine-treat is to get an appointment with a neurologist - not an easy thing to do in Ireland where they are in shockingly short supply - and try to tackle the issue from the bottom up, as opposed to only treating the symptoms. So it's not easy to cope with, and it's not cheap either - but it is possible and you don't have to put up with it. In addition to consultants bills, my month's supply of Topamax is about €70, when I need to fill the prescription for Zomig it's over €100 in total (make sure you sign up for the drugs scheme card if you go this route; ask for information in the chemist), but by god is it worth it. Not so many lost days lying in bed looking green, holding my head and just feeling like crap. Yes, I have to take tablets every day to regulate the blood flow, yes I do still get migraines - especially around the time of the month, if I drink too much and if I am too stressed - but they are much more manageable now. When I feel the onset, I can take a tab, feel rough for an hour or so and then feel ok again. I can live with that. If you are susceptible, if your headaches are escalating - and they tend to - if painkillers can't control and manage the pain and your quality of life is suffering then do something about it. Honestly - there's no need to live with it. I know we have a ton of migraine sufferers on the blog; how do you cope? We tried out the new Inchloss Detox Express - but did it make a difference?